Tricia founded Lavish Jewelry in 2005 in Brazil, her unique concept is to combine hand-crocheted gold metal thread and glass beading into amazing sculptural forms that work into finished jewelry. The metal used is primarily copper clad in 18kt gold vermeil. It is a style that is exuberant in color and unique in ethereal, non-solid shapes. 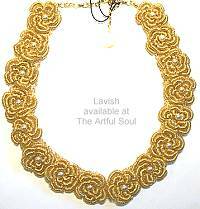 Beautiful and striking necklace is made with thin golden wire thread. Underneath is a crocheted flat ribbon, upon which are all the flower shapes that are also crocheted and wrapped in wire, a white glass pearl at the center. Necklace curves gracefully around the neck. 16 inches of flowers, chain and lobster clasp adjust finished length 18-21 inches. Thin golden wire is crocheted and wrapped into a beautiful 1 inch flower design with white glass pearl at the center. Earrings dangle 1-1/2 inches long on goldplated earwire. Larimar aqua blue and icy white cloud glass beads are crocheted into undulating circle with thin golden wire. Earrings are 1-3/4 inches long on goldplated earwire. Thin golden wire is crocheted into mesh ribbon that is 1-5/8 inches wide and flexible to wrap the wrist. 7 inches long. The magnificent centerpiece is more circles of crocheted golden wire capturing glass beads in larimar aqua, ice white, and smokey quartz bronze. Magnetic clasp is easy and secure, the wide bars have interlocking pins and magnets to stay put! Read about what others think of Lavish jewelry! Instead of reviews for a specific product, this is a place to share about the designer line in general.